Photo: Students of Viqarunnisa Noon School and College stage demonstration in front of the main gate of the school in Dhaka on Wednesday, December 05, 2018. Dhaka, Dec 5 : The case, filed against three teachers of Viqarunnisa Noon School and College, including its principal, over the suicide of schoolgirl Aritree Adhikari, has been transferred to Detective Branch of Police. Md Mahabub Alam, joint commissioner (DB), said that the case was transferred to DB police from Paltan Police Station on Wednesday for thorough investigation. 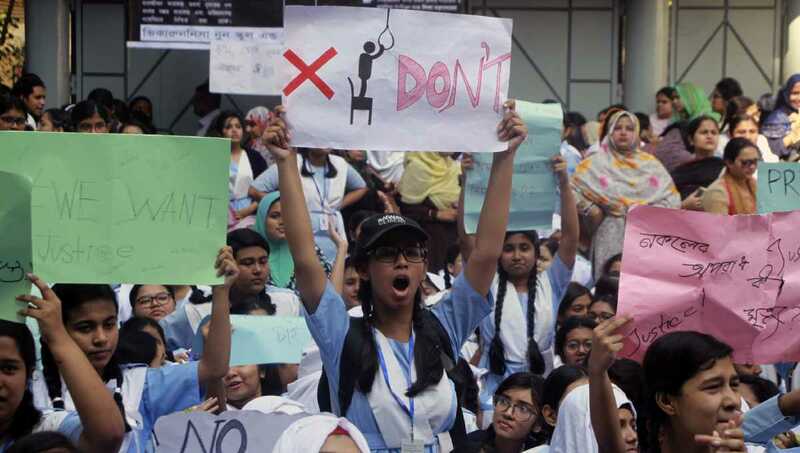 Victim’s father Dilip Adhikari filed the case with Paltan Police Station on Tuesday night accusing Principal Naznin Ferdous, morning shift in-charge Jinat Akhtar and class teacher Hasna Hena of provoking Aritee to committing suicide. Aritree Adhikari, a class-IX student, committed suicide at their Shantinagar residence in the city on Monday after allegedly being rebuked by teachers for using mobile phone during examination.